I wish you a fantastic Wednesday morning with one of my favorite drummers, Steve Gadd! Stephen Kendall Gadd (born April 9, 1945) is an American drummer, percussionist, and session musician. Gadd is one of the most well-known and highly regarded session and studio drummers in the industry, recognized by his induction into the Modern Drummer Hall of Fame in 1984. Gadd’s performance on Paul Simon‘s “50 Ways to Leave Your Lover” and Steely Dan‘s “Aja” are examples of his style. He has worked with popular musicians from many genres, including Simon & Garfunkel, Steely Dan, James Taylor, Eric Clapton, Kate Bush, Joe Cocker, Grover Washington Jr., Chick Corea, Lee Ritenour, and Al Di Meola. 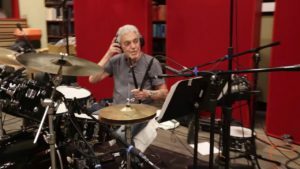 In this video Steve Gadd explains “50 Ways”. Gadd is a native of Irondequoit, New York, a suburb of Rochester. When he was seven years old, his uncle, a drummer in the US Army, encouraged him to take drum lessons. By the age of eleven Gadd had sat in with Dizzy Gillespie. In a Modern Drummer interview Gadd mentioned that some of his influences at a young age and later on included Buddy Rich, Elvin Jones, Tony Williams, and the “less is more” style of Rick Marotta. After graduating from Irondequoit’s Eastridge High School, he attended the Manhattan School of Music for two years before transferring to the Eastman School of Music in Rochester, playing in wind ensembles and concert bands. After Gadd finished college in the late 1960s, he played regularly with Chuck Mangione and his brother Gap. His first recording was on Gap Mangione’s debut solo album, Diana in the Autumn Wind (1968). But he left the group. In the 1970s and 1980s, he toured internationally, and recorded with Paul Simon and also with Al Di Meola’s Electric Rendezvous Band. In 1976, Gadd and other session musicians in New York City, including Richard Tee, Eric Gale and Cornell Dupree, formed the group Stuff. Their work included appearances on NBC’s Saturday Night Live, both performing on their own and backing Joe Cocker. In 2005, along with Abraham Laboriel, Patrice Rushen and others, Gadd was awarded an honorary Doctor of Music degree from Berklee College of Musicfor outstanding contributions to contemporary music. Way Back Home: Live from Rochester, NY by the Steve Gadd Band is nominated for the Grammy Award for Best Contemporary Instrumental Album at the 59th Annual Grammy Awards. A short list of musicians with whom Gadd has worked includes Frank Sinatra, Paul McCartney, Paul Simon, Steely Dan, Al Jarreau, Joe Cocker, Stuff, Bob James, Chick Corea, Eric Clapton, Pino Daniele, James Taylor, Jim Croce, Eddie Gómez, The Manhattan Transfer, Michal Urbaniak, Steps Ahead, Tony Banks, Manhattan Jazz Quintet, Carly Simon, Richard Tee, Jon Bon Jovi, Chet Baker, Paul Desmond, The Bee Gees, Michael McDonald, Michel Petrucciani, Kate Bush, David Sanborn, Kurt Baebi, and Blicher Hemmer Gadd. The bonus track of today’s Steely Dan’s “Aja”. I wish you a sunny late summer Wednesday and come back very soon with a new story.